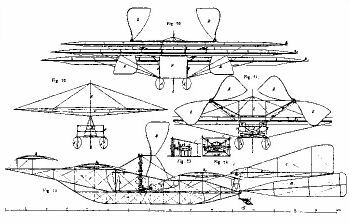 The first powered marine flying machine (and incidentally the first full-size aircraft to have a petrol engine) to be brought to the point of testing was Wilhelm Kress' flying boat (Chanute's term). It had two aluminium floats or hulls to which three wings were attached in tandem. Alas for the persevering Kress, who had been experimenting with aerial devices since 1877 and had waited something like two years to test his flying boat, as the craft was beginning to lift from the water on a trial during 1901 he saw an obstruction ahead. He slackened speed and attempted to turn; but the machine capsized.